This is a critical moment for economic policy in the industrialized countries. After a year and a half of emergency rescue, with large fiscal deficits and rock-bottom interest rates, governments are beginning to pull back. Especially in countries with large current account deficits, stimulus spending is being withdrawn, and central banks are under pressure to begin raising rates and tightening money. The threat of deflation and cascading insolvencies in the financial system are so yesterday; today’s threat is said to be inflation and sovereign default. If you survey the center-to-left economics blogs, including this one—economists who see the world at least in part through Keynesian eyes—you will find howls of protest. It is simply irrational, we say, to allow this slump to run its course. There is no threat of inflation at all, which is actually a problem, since a bit of inflation would be medicine against effectively high nominal interest rates at the zero lower bound. And every indication is that the recovery under way owes its feeble pulse to the lingering effects of last year’s stimulus. But is this just a problem of economic analysis? Is it only that New, Post and other Keynesians haven’t been persuasive enough? Does economic argument and evidence drive policy? In a sense yes: those who make the decisions summon economic arguments to justify their actions. But who gets to make the decisions and what arguments they find appealing is not the outcome of academic seminars. What got us into this mess in the first place, and what now threatens to throw us back into the maelstrom, is the political hegemony of the “finance perspective”, the interests and outlook of those whose main concern is maximizing (and now simply protecting) the value of their financial assets. Within the world of elite interests, this is almost a mass constituency. While the bulk of such assets are held by an infinitesimal few, perhaps the top 10-20% of the population in the industrialized countries have significant financial wealth and actively monitor their returns. Their understanding of how economies work and what priorities policy-makers should adhere to follow from their personal position. Inflation is a constant threat to asset-holders. They fear the laxity of central banks as well as the buildup of government debt, which can serve as an incentive to future inflation. They want their portfolios to have a component of absolutely risk-free government securities, and the very whisper of sovereign default chills them to the core. They believe in the inherent reasonableness of financial markets and believe that anyone who wishes to borrow from them should demonstrate their prudence and fiscal rectitude. They were willing to relax their principles temporarily during the panic, but now that they have caught their breath they want to see a return to “sound” practices. Governments will bend to their wishes not because they have better arguments, but because they hold power. Don’t get me wrong. I am not making the crude claim that policy is driven directly by interests. In fact, I believe that, if they get their way, holders of financial assets will suffer along with the rest of us. (Not as much, of course: succumbing to a haircut because of debt deflation cannot be compared to losing one’s job and not being able to meet basic needs.) The process is more complicated: where one sits in society and the kinds of problems one typically has to solve leads to a way of thinking, and this manner of thinking then informs politics. For centuries, the finance perspective has played a central role in economic theorizing, and there is ordinarily a body of research to support it. What I am proposing is this: economic orthodoxy is regaining control over policy because it reflects the outlook of those who occupy the upper reaches of government and business. Up to this point, the Great Economic Event we are passing through has not caused even a hint of political realignment, and that is why policy is returning to the old normal. 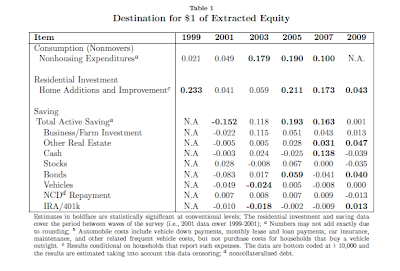 Daniel Cooper of the Boston Fed has posted a summary of his recent study of household consumption and its relationship to home equity extraction. He uses the Panel Study on Income Dynamics (PSID), because it has detailed information on all the relevant household financial information. What Cooper wants to know is, to what extent did households use their rising home values during the bubble years to finance higher levels of consumption? His study is useful in many ways but ultimately doesn’t answer the question he is asking. The shortcomings are instructive. First the results. The summary can be seen in this table, a condensed version of Table 8 in Cooper’s original paper. It appears that at no time was the mortgage ATM machine used to finance more than twenty cents per dollar of equity extraction. This seems to suggest that the housing bubble played a minor role in financing the consumption boom of the 00's, and that the deflation of this bubble should be having little effect on consumer demand during the current period. There are two significant problems. 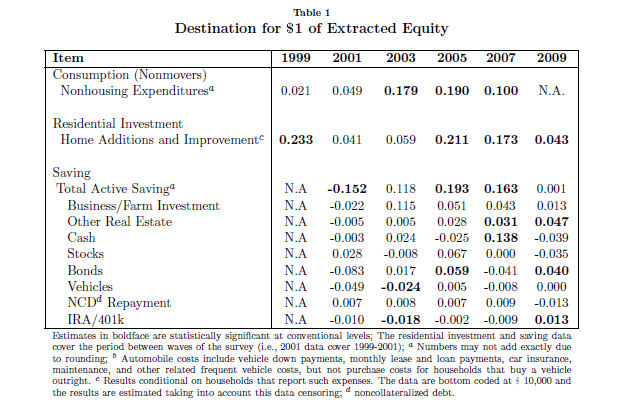 One is on the household level: Cooper’s analysis tries (not entirely successfully, but that is another matter) to control for the endogeneity of the equity extraction decision—the impact that changes in household income have on the decision of households to pull money out of their homes via refinancing. The idea is to isolate the role of equity extraction as an “independent” decision. From a macroeconomic standpoint, however, this is not appropriate. Even if equity extraction is simply a conduit for economic influences originating elsewhere, its role is still significant. After all, it is the bubble that opened this channel and the deflation of the bubble that is shutting it down. The Cooper exercise is interesting from a sociological point of view. His more detailed work uses PSID data to get at the differences in equity extraction across different income groups and according to other demographic criteria. I learned a lot. Nevertheless, it doesn’t alter the systemic significance of the rise and fall of equity extraction for financing domestic demand during a period of aggregate net borrowing (global imbalances). I guess the campaign against statism changes course when the state goes after people the TPers don’t like. And whatever you do, don’t let rock stars or other private individuals challenge government decisions through the nefarious methods of supply and demand. Across the industrialized world, governments have responded to the economic crisis by running enormous fiscal deficits, rediscovering a deep, previously unacknowledged love for the legacy of John Maynard Keynes. Now there seems to be a gathering consensus that these deficits are unsustainable and have to be cut as quickly as possible. This seems to be the word from the Group of 30, the OECD, the EU, Obama’s deficit commission and the US Congress. Genuine Keynesians have to be worried. If so many governments simultaneously decide to withdraw stimulus, the combined effect could well be to tip the world into a second round of economic tailspin. Just for starters, assume a multiplier of one; then the average reduction in fiscal deficits as a percentage of combined GDP has to be deducted from projected growth rates. Given plausible numbers on both sides, the result could well be negative. A multiplier greater than one, particularly in light of trade spillover effects, pushes us further into the red. But the economic myopia is, if anything, even more fundamental. The deficit hawks seem to have forgotten, if they ever learned, the granddaddy of all accounting identities: a country’s current account is equal to the sum of its domestic budget positions. If you hold the CA constant, a reduced fiscal deficit is feasible only if it is offset by a corresponding increase in the indebtedness of households and firms. Of course, it was the inability of the private sector to sustain its borrowing that led to the crisis, and the runup in fiscal red ink, in the first place. Notice that the biggest pressure to cut government spending is being felt in the countries running current account deficits, like the US, the UK and the peripheral members of the eurozone. This is not surprising, since, according to the laws of arithmetic, they must also have the biggest domestic budget deficits. If squeezing the public sector could produce expenditure-switching, so that countries on a fiscal diet would also find their way to external balance without economic collapse, that would be the proper medicine. Unfortunately, there is no evident channel by which this can happen. The US and the UK are unlikely to see a substantial devaluation as a result of their fiscal rectitude, and the folks in the eurozone can’t devalue at all. If there is to be rebalancing as a result of these cuts, it will happen only through shrinkage of incomes and employment. So that’s what the arithmetic tells us: fiscal cuts must equal the sum of increased private indebtedness plus decreased external deficits, where the latter are driven by economic contraction. Lovers of historical irony will note that this is exactly the circumstance Keynes was responding to in the 1930s, informed by his prior analysis of the imbalance-generating Treaty of Versailles. His insistence on the need for symmetry in adjustment was directed against the foolhardy insistence that deficit countries must shrink and shrink, dragging down the surplus countries as well. Today's Washington Post metro section reports in "U-Va begins court fight of subpoena by Cuccinelli" that initially their Board was going to go along with his request for emails and records of climatologist and former Environmental Sciences prof, Michael Mann, father of the "hockey stick" diagram. However, piles of petitions from academics across the country, including critics of the scientific work of Mann, pushed them and U-Va prez John Casteen to change their stance and resist the demand by their supposed attorney. After all, the state attorney general is supposedly the attorney of state agencies like the University of Virginia, so it is a bit odd for them to be in a court against each other. Quite aside from the matter of political attacks on academic freedom involved here, Cuccinelli seems not to have much of a leg to stand on regarding even the trival legal issues. So, he is acting on the basis of an anti-fraud statute passed in 2002 that is to catch people engaging in fraud with state funds. Mann got five grants for his research, but four of them were federal grants, and the only one that was a state grant was granted in 2001, the year before the statute was passed. Now there are people defending this outrageous nonsense, such as Sheldon Steinbach, "a lawyer who represented the American Council of Education for 37 years," who defended Cuccinelli. "Sometimes upon more detailed explanation you might determine people have, indeed, cooked the books." Let us be clear. This is not a matter of Mann "cooking the books" to waste state funds on prostitutes in Las Vegas. Cuccinelli is hoping to find something like the "use a trick" quote from the East Anglia climategate emails, which is not a matter of "cooking books" but simply a reference to using better statistical methods, as anybody who knows anything about this knows. Apparently Steinback is not among them. In any case, I applaud the Board and the President at the University of Virginia for standing up to this utterly indefensible assault on academic freedom by the Commonwealth's Attorney General. More power to them, and may the courts rule in their favor. As it is, President Casteen has accurately stated that, "The attorney general's order has sent a chill throught the Commonwealth's colleges and universities." Real state and local government purchases (2005$) had fallen from $1543.7 billion per year as of 2007QIV to $1537 billion per year as of 2009QIV and then dropped to $1521.7 billion last quarter. Economists understand the problem with state governments needing to annually balance their budgets and one of the big concerns is that such pro-cyclical fiscal policy could undermine much of the Federal fiscal stimulus – a phenomena known as 50 little Herbert Hoovers. We also have a remedy for this problem known as Federal revenue sharing if those in Washington, DC have the wisdom and courage to adopt such a sensible move. The emergency spending bill before the House would address the education crisis facing communities across America -- and the jobs of hundreds of thousands of teachers are at stake. Because of continued high unemployment, state and local budgets are stressed to the breaking point. Many states and localities are drastically cutting education spending. This year school districts in Hawaii went to only four days of instruction a week. In many other districts, officials are ending the school year early to save money. Most worrisome, hundreds of thousands of public school teachers are likely to be laid off over the next few months. As many as one out of every 15 teachers could receive a pink slip this summer, the White House Council of Economic Advisers estimates. These layoffs would be spread throughout the country -- in urban, rural and suburban districts. Such layoffs are terrible for teachers, for communities and, most important, for students. For the families directly affected, layoffs mean not only lost wages but often lost homes and postponed dreams. Because unemployed teachers have to cut back on spending, local businesses and overall economic activity suffer. And the costs of decreased learning time and support for students will be felt not just in the next year or two but will reduce our productivity for decades to come. Additional federal aid targeted at preventing these layoffs can play a critical role in combating the crisis. "This is fiscal recklessness. And that's why even some Democrats are starting to revolt," Senate Minority Leader Mitch McConnell (R-Ky.) said in a speech on the Senate floor. "Far from doing anything about our own looming debt crisis, Democrats only seem interested in making it worse." His call for fiscal restraint in a time when unemployment is high given weak aggregate demand can be seen as follows – far from doing anything about our weak economy, Republicans only seem interested in making it worse. OK, the Senator from Kentucky might be allowed to have one vote on fiscal policy matters even if his views on fiscal policy as dumb as those we have learned to tag as Hoover economics but why should we allow him to effectively block any action by Congress? If you read Mark Thoma's blog, you will have seen his passionate response, called "Modern Macroeconomic Theory and Fiscal Policy" to some self-styled "modern macroeconomic theorist" who claims that people like Brad Delong and Krugman who think that fiscal policy can help us out of a recession when the interest rate is at the zero bound are not modern macrotheorists and so are obviously wrong. Thoma and Krugman's response has been to cite papers by DSGEers in which a version of the model does allow fiscal policy to work - papers by Eggertson and Woodford and others of that ilk. Read the two comments by Robert Waldman to be reminded of why he- Robert - is a national treasure. Waldman says the DSGEers cannot be presumed to have explained anything about the modern macroeconomy at all, so the idea that we have to reject the idea that fiscal policy is efficacious if a DSGE model can't show it to be is a nonsensical non sequitur. I've looked at the latest Eggertson paper. They are all -all the fiscal-policy friendly DSGE papers, I mean- alike in making the mechanism by which fiscal policy works in a liquidity trap this: it increases expected inflation. This is not the mechanism by which it works in Keynes. Of course if it works, it increases Y and that will increase inflation and expected inflation chez Phillips/Friedman/Phelps. The expected inflation is consequence, not cause. The reason that it works in Keynes, of course, is that it increases demand. Period. Put another way: In a liquidity trap, the problem is that the Wicksellian/Keynesian natural rate is below the expected deflation rate (the latter may be a small negative number, as it is now), which latter is the lower bound on the real rate of interest given that nominal rates can't be negative. Fiscal policy in the trap works not, or not necessarily, by reducing the lower bound, but rather by raising the natural rate above the lower bound. But this can't happen in the DSGE models, because the natural rate - what they call the natural rate, which isn't what Keynes and Wicksell meant by it - can never change. That's a fact about their ridiculous models, not a fact about the world. A column in today's Washington Post by Ruth Marcus reports such an incredible quotation from Sarah Palin, that I am simply going to reproduce it without any commentary, other than to note that it was made during a recent speech in favor of a losing tea party candidate in Idaho she favored (where there appear to have been several "tea party" candidates) and to remind one and all that she was the loudest advocate of "drill, baby, drill" back in 2008. So, Sarah Palin. "The oil companies who have so supported President Obama in his campaign and are supportive of him now -- I don't know why the question can't be asked by the mainstream media and by others if there's any connection with the contributions made to President Obama and his administration and the support by the oil companies to the administration. If there's any connection there to President Obama taking so doggone long to get in there, to dive in there, and grasp the complexity and the potential tragedy that we are seeing here in the Gulf of Mexico." This time it was in today's Washington Post Outlook section, although, well, it was a column by the president of the American Enterprise Institute, Arthur G. Brooks, "The New Culture War." This is supposed to be between "statism" and the "free enterprise system," the now-favored term by libertarians over "capitalism" as the latter is not popular among young people, but the former is. Brooks cited a poll showing that 70% of Americans approve of "the free enterprise system" and only 30% believe we would be better off "without free markets at the core of our sysytem." OK, fine, this is believable. But then Brooks somehow decides that this 70% also believes that "free enterprise brings happiness; redistribution does not," and "that it is 30% coalition, not the 70% majority, that is fundamentally materialistic." Brooks gives no ground for any program at all in any form, whether food stamps, or social security, or medicare, or progressive income taxation, or whatever. They are all bad and not supported by the free-enterprise-loving majority. I guess this would include all those tea partiers who were opposed to Obama's "socialistic" health care reform because it might damage their free market medicare. The New York Times, supposedly the reliable voice of bleeding-heart liberalism, has repeatedly attacked European welfare state institutions in its news pages. The latest assault was published today, informing us that pensions and other social benefits are no longer “affordable” and that the coddled European public must wake up and face reality. All such “analyses” require the reader to accept without questioning the strange notion that social programs that were instituted decades ago when Europe was substantially poorer have now become, after a long run of economic growth, too expensive to bear. The article suggests that all sorts of damage has been caused by excessive concern for the old, the sick and other insufficiently productive citizens, with the result that “the region generally lacks competitiveness in world markets.” I have to rub my eyes every time I see a comment like this. Let’s get this straight: journalists tell Europeans to emulate America’s high-octane approach to economic efficiency when the Eurozone has approximately balanced trade with the rest of the world, while the US runs the largest trade deficits the world has ever seen. It is true that the current economic stall, combined with immense, ill-considered financial bailouts, has diminished the fiscal space available to governments everywhere. This is a problem of, well, stalled economic growth and unwise bailouts. Europe, like the US, needs to deal with this. But those problems have nothing to do with “unaffordable” social welfare programs. On the contrary, maintaining transfers to the most vulnerable households is not only the right thing to do, it is also an excellent vehicle for sustaining effective demand in a downturn. Maybe, if you prowled the cafes and restaurants of Europe long enough, you might find an interviewee or two to stick up for social solidarity. Social Security: On the Chopping Block Again? Out of FireDogLake comes a new report that the Deficit Commission Obama set up is getting ready to carve out hunks of Social Security, perhaps by zipping the cuts through a lame duck session of congress. Bad ideas with money behind them never die, do they? Is it time yet to pull our old writings out of the archives and spread the word that, no, Social Security is not in trouble, and that cutting it would be bad for our people and bad for the economy? So, Rand Paul has just denounced Barack Obama as being "un-American" (do we need a special House committee for this? ), for criticizing British Petroleum's behavior in the Gulf of Mexico. Something funny about this is not just the name, but indeed the ownership: while there are certainly some American stockholders, BP is overwhelmingly British, indeed was substantially owned by the British government itself for many decades from WW I up into the Thatcher era. Since when is it "un-American" to bash a British company for misconduct? The libertarian answer in this instance is that property rights trump civil rights, and that the state should prioritize enforcing those. in a world with constant returns to scale in production, two segregated economies with the same distribution of skills would completely bypass discrimination and would have equal wages and equal returns to other resources, regardless of the desire to discriminate against the segregated minorities ... A literature has developed on whether discrimination in the marketplace due to prejudice disappears in the long run. A fair reading of Becker’s Nobel Lecture, however, would note that he believed that private discrimination by the majority does injure the minority. Is this the kind of economic policy Tea Party types such as Rand Paul are advocating? According to this morning’s New York Times, British Petroleum, with apparent cooperation from the US government, is making an all-out effort to obstruct measurement of the ongoing Deepwater Horizon oil blowout. University researchers have been prevented from approaching the scene, and whatever data are being collected are being withheld from the public. A possible scenario is that numbers will be released only after the flow has stopped, that they will not be viewed as credible, but it will be too late to correct them. BP’s legal team is no doubt emphasizing that effective defense against liability began on day one of the blowout and continues until the end of the process. It would be interesting to know what motives impel cooperation on the government’s side. I hope the political focus is sharpened: we need the most accurate possible measurements of how much petroleum is entering the gulf and how and where it is being transported, starting right now. UPDATE: My crude economic speculation is corroborated by actual investigation. And someone should tell the good people at NRDC that squeezing BP dry in court is not a secondary matter to the current cleanup; it is society's first line of defense against future eco-malfeasance. Proposition 100 is commendable. Fiscal restraint during weak aggregate demand is generally bad economics but state governments often are forced into such measures by their requirements to annually balance their budget. If the choice is between reducing government purchases versus a temporary tax increase, then on Keynesian grounds the latter is the least undesirable move as it likely has less of an impact effect on aggregate demand. Then again – state governments would not be faced with such Draconian choices had we decided to increase Federal revenue sharing by more than what barely got through the Senate. Google’s extraordinary acknowledgment that they have been collecting private internet transmissions in the process of constructing their Street View database raises questions that have not yet been properly aired. The don’t-be-evil crew has had its specially equipped cars crawling urban streets around the world, creating the photographic record that enables map searchers to see street-level images when they click on a location. This already alarmed privacy hawks in Europe (where privacy laws are much stricter than here), since it means that everyone’s home, and maybe their car, pets, lawn furniture and messages to the postman, are on display before the whole world. But the new disclosure goes a lot further. Google says its cars were using the locations and IP addresses of wi-fi hotspots along its route to verify its position, a plausible notion because the data collected from the different cars have to be concatenated, and discrepancies would cause headaches. How then to explain why Google collected not only this minimal information, but also “snippets” of email and the websites users were visiting at the time of the drive-by? In its repeated public apologies, Google claims that collecting and storing these data was an accident, a coding error, a breakdown in communication between multiple teams collaborating on the project. This is not credible. Even if it were necessary to acquire all the information streaming from these users to identify their location—which seems strange to me, but I’m not a network geek—whatever technique used to extract the few items they needed could have been used to expunge the rest. Can anyone really believe that vast quantities of personal data were not only captured but stored at significant expense simply because of an oversight? And let’s take it one step further. Google’s business model is to sell your personal data to advertisers, nothing more or less. The ads you see on search pages and to the side of Gmail messages have value because they are tailored to the content of your internet activity. Google captures the content and sells the ads. They have every incentive to capture as much content as they can. Distilling ad-relevant data from messy, real-life internet use is extremely difficult, which is one reason why Google employs lots of very smart people. Their struggle to constantly improve on this distillation is fed by the massive web data to which the company has access. This is where the Street View cars come in: as a byproduct of their positioning system, they were collecting random web activity which Google could not otherwise obtain. A key question for investigators, then, should be whether the personal data Google admits to collecting and storing was used by any unit of the company for analytical purposes. Beyond this, we should recognize the paradox at the heart of Googledom. In many ways this is an admirable company, driven by idealism. Their business model allows them to offer a range of very high-quality services for free. They have a commitment to making the world’s information more accessible to the ordinary user, which is mostly a good thing. But in the final analysis, the money comes from advertisers, and they pony up because Google’s individual-level data permits a degree of customization marketers could only have dreamed of until recently. This generates a powerful financial incentive for Google to undermine privacy whenever the opportunity arises, as it does every time you use one of their tools. This company, and others in the same line of work, needs to be tightly regulated. For all the talk about support the troops, hypocrisy is the order of the day. Neoconservatives applaud new wars, while neoliberals want to do it inexpensively, so long as the cuts don't harm the bottom line of their favorite military contractors. The easiest way to do that is to shortchange the soldiers. I apologize for the length, but the punchline comes toward the end of this possibly excessively-long note. Just as right-wing politicians go to great lengths to protect fetuses, only later to trash them if they have the gall to be born to poor families, the government acts with similar hypocrisy toward former troops who have become veterans. Recent scandals have shined a harsh light upon poor treatment of former soldiers. As a result, the military created so-called Warrior Transition Units, which turned out to perhaps be even worse, including a number of suicides. Here are my notes from a recent New York Times article. Dao, James and Dan Frosch. 2010. "Feeling Warehoused in Army Trauma Care Units." New York Times (25 April): p. A 1. Created in the wake of the scandal in 2007 over serious shortcomings at Walter Reed Army Medical Center, Warrior Transition Units were intended to be sheltering way stations where injured soldiers could recuperate and return to duty or gently process out of the Army. There are currently about 7,200 soldiers at 32 transition units across the Army, with about 465 soldiers at Fort Carson’s unit. But interviews with more than a dozen soldiers and health care professionals from Fort Carson’s transition unit, along with reports from other posts, suggest that the units are far from being restful sanctuaries. For many soldiers, they have become warehouses of despair, where damaged men and women are kept out of sight, fed a diet of powerful prescription pills and treated harshly by noncommissioned officers. Because of their wounds, soldiers in Warrior Transition Units are particularly vulnerable to depression and addiction, but many soldiers from Fort Carson’s unit say their treatment there has made their suffering worse. Some soldiers in the unit, and their families, described long hours alone in their rooms, or in homes off the base, aimlessly drinking or playing video games. At Fort Carson, many soldiers complained that doctors prescribed drugs too readily. As a result, some soldiers have become addicted to their medications or have turned to heroin. Medications are so abundant that some soldiers in the unit openly deal, buy or swap prescription pills. At least four soldiers in the Fort Carson unit have committed suicide since 2007, the most of any transition unit as of February, according to the Army. In many cases, the noncommissioned officers have made it clear that they do not believe the psychological symptoms reported by the unit's soldiers are real or particularly serious. At Fort Hood, Tex., a study conducted just before the shooting rampage there last November -- which found that many soldiers in the Warrior Transition Unit thought their treatment relied too heavily on medication -- also concluded that a majority of the cadre believed that soldiers were faking post-traumatic stress or exaggerating their symptoms. In the job just 10 weeks, Clifford Stanley, the Pentagon's chief of personnel, already has forced out two senior deputies, including one overseeing the high-priority -- and highly scrutinized -- program caring for troops wounded in Iraq and Afghanistan. Stanley said his goal was for the Pentagon's vast personnel operation to be "more responsive, sensitive to and aware of our constituency." ...he is trying to "hold up a mirror of compassion and caring" to reflect a more welcoming face of the Pentagon leadership. ...Service members, spouses and families have sought more in health care and education benefits to help compensate for their sacrifices in protecting the nation. Advances in battlefield medicine have saved the lives of many grievously wounded, but they now require costly rehabilitation and care. And the Pentagon is only beginning to learn how best to treat wounds that are not visible, to the brain and to the spirit. All of a sudden, we hear something else. Neoliberalism replaces neoconservatism: care for the troops becomes another one of those lavish government programs, which must be cut back in order to be able to afford the next war. Caring for disposable soldiers siphons off valuable money required to pay for necessary hardware. The Pentagon, not usually known for its frugality, is pleading with Congress to stop spending so much money on the troops. Through nine years of war, service members have seen a healthy rise in pay and benefits, with most of them now better compensated than workers in the private sector with similar experience and education levels. Congress has been so determined to take care of troops and their families that for several years running it has overruled the Pentagon and mandated more-generous pay raises than requested by the George W. Bush and Obama administrations. It has also rejected attempts by the Pentagon to slow soaring health-care costs -- which Defense Secretary Robert M. Gates has said are "eating us alive" -- by raising co-pays or premiums. In the midst of two long-running wars in Iraq and Afghanistan, defense officials are increasingly worried that the government's generosity is unsustainable and that it will leave them with less money to buy weapons and take care of equipment. Clifford L. Stanley, the undersecretary of defense for personnel, told a Senate committee in March that rising personnel costs could "dramatically affect the readiness of the department" by leaving less money to pay for operations and maintenance. Overall, personnel expenses constitute about one-quarter of defense spending. Health care alone is projected to cost the military $51 billion next year, nearly one-tenth of the Pentagon's budget, excluding the costs of the wars in Iraq and Afghanistan. Since 2002, wages have risen 42 percent, compared with about 32 percent for the private sector. Housing and subsistence allowances, which troops receive tax-free, have gone up even more. Other well-meaning programs to support service members and their families have turned into budgetary Frankensteins. In February, the Pentagon abruptly shut down a new tuition-assistance program for military spouses after it was overwhelmed with applicants. Defense officials had set aside $61 million for the program, which reimburses tuition costs of up to $6,000 per person, but discovered they might need as much as $2 billion to satisfy unexpected demand. Congress chastised the Pentagon for mismanaging the program, which has since resumed, though defense officials aren't sure how they will pay for it. So, there you have it. Compassion be damned. We must fight against the budgetary Frankensteins so we can fight more wars. I am just back from the Global Conference on Child Labor, put on in The Hague last week by the International Labor Organization (ILO) and the Dutch Ministry of Social Affairs and Employment. There was a dramatic confrontation behind the scenes, and I will tell you how it went, but it won’t make any sense without a large dose of background, so bear with me. From the standpoint of global governance, child labor falls under the aegis of the ILO and its International Program on the Elimination of Child Labor (IPEC). The ILO is the UN agency that deals with labor issues, and it has a unique governance structure, with a Governing Body (like a board of directors) composed not only of government officials but also representatives of unions and employer federations. The Governing Body meets in Geneva in June and votes on international conventions written by ILO staff. These conventions are then submitted to national governments for ratification and become the legal framework for official international coordination. Full labor market participation. This means participating in the labor market exactly as an adult; the minimum age is 18, when a person is no longer deemed a “child”. Restricted labor market participation. This is the same as full participation, except that work that would be especially hazardous at a younger age and work that conflicts with education are prohibited. The minimum age is 15 in developed countries, 14 in less developed countries. Light work. This refers to a much more modest set of activities, less demanding in time and effort; there is a lot of scope for countries to determine what it does or doesn’t allow. The minimum age is 13 for developed countries, 12 otherwise. Beneficial work. The convention does not restrict tasks children might perform for a few hours per week that are beneficial for them and their families (even if the kids don’t want to do it at the time). Think of washing the dishes after dinner or feeding the chickens in the back yard. Incidentally, “work” in this context includes not only paid employment, but also unpaid but economically productive activity in the household or in family enterprises. In fact, the majority of child laborers work as members of their family, most in agriculture. Convention 182 focuses on the worst forms of child labor (WFCL). These are divided into two groups. The “unconditional” worst forms are those that are inappropriate under all circumstances, things like prostitution, soldiering, bonded labor, and smuggling. The other category is hazardous work, which is identified at the national level and based on evidence of harmful physical or psychological impacts. Many children working in subsistence agriculture are regarded as being exposed to excessive hazards, such as dangerous equipment, chemicals, extreme temperatures, large animals and physical stress. In its latest report, the ILO estimates that 215 million children are engaged in child labor as defined by Convention 138, and that 115 million of them are in hazardous work. There are no reliable global estimates for unconditional WFCL. The ILO has adopted the goal, ambitious or delusional depending on your point of view, of eliminating all WFCL by the year 2016. (This is one year after the 2015 deadline for the Millennium Development Goals, which are related but different.) Whether or not this goal is reached, it is used as a framework for mobilizing resources, fostering programs around the world and setting local targets. The Hague conference was organized as a check-in to determine the rate of progress so far and to set priorities for the next three years. There will be a follow-up conference in Brazil in 2013, a last rallying event before the 2016 target. The main product of the conference was a roadmap document, suggesting what governments, international agencies and civil society (employers, unions and NGO’s) should be doing for the next three years. It went through several iterations, with a final negotiating session on the first night of the conference. It will be submitted to the ILO’s Governing Body next month. That’s the background; here’s the story. At the eleventh hour, at this final negotiating session, the US government delegation, supported by the employers, raised several fundamental objections to the proposed roadmap. In particular, they opposed any mention of Convention 138 or action against child labor in general. According to their demands, the only issue was Convention 182; we should eliminate the WFCL but sidestep the rest. They also opposed any reference to particular economic sectors like agriculture. Somehow the world is supposed to remove WFCL with a fine scalpel, leaving all other issues untouched. The talks went on and on into the night, adjourning at 3 am. Every time the majority group (most governments, international agencies, NGO’s, unions) offered a compromise, the US team would step out into the hallway, pull out their cell phones and call Washington for instructions. The message was always the same: fight over every word, every comma. In the end, the only compromise allowed was a reference to child labor and Convention 138 in the preamble; the action items were scrubbed clean. Officially, the international community abstains from making any commitment to address child labor unless it is specifically hazardous. Half of the estimated child labor is to be eliminated, the other half ignored, at least for the next several years. One small but telling irony: on the eve of the conference a rump group of academics organized by a German faction that calls itself “child labor protagonists” sent out a manifesto on the conference email list. Using militant language, they denounced efforts to eliminate child labor as elitist and ethnocentric. This is just another example of Europeans trampling other cultures underfoot, they said. Moreover, the only legitimate question is what children want. They want to work, as we know (because they are working), so let them work. The only intervention they recommend is supporting “unions” of child workers, which will supposedly lead to better and better-paid work. They called for the repeal of Convention 138 and the downsizing or elimination of IPEC. They demanded that child workers (or at least the ones affiliated with their organizations) be represented at international meetings. They should be happy at the outcome of the conference; thanks to the US government and the employers, they have made progress toward at least some of their goals. What makes all of this such a strange spectacle is the actual situation on the ground. Suppose the primary goal is to remove 115 million children from hazardous work. That’s a lot of kids. You aren’t going to do this by creating thousands or millions of narrowly targeted intervention programs, teams of trained labor inspectors and social workers who will go out into communities and identify these children one by one. No, it is possible only by using broad spectrum methods that address non-hazardous forms of child labor as well. The most important of these is the provision of supplementary income to poor parents of school-age children. These income transfer programs, which often include requirements that children attend school or that their families take part in health and nutrition programs, have a wonderful track record of reducing child labor while also improving living standards. Everyone who studies child labor agrees on this. So what is the point of going to the mat over whether the roadmap rigorously excludes any mention of child labor that is not hazardous? That’s a real question: I’m wondering whether there is any motivation behind the US position beyond pure neoliberal ideology. (The same question could be asked of the “protagonistas”: in the end, is it all about freedom of contract in the labor market?) I don’t know the answer—I’m just asking. The new law, which takes effect at the end of the year, is a victory for Tom Horne, the state superintendent of public instruction, who has fought for years to end Tucson’s ethnic studies programs, which he believes teach students to feel oppressed and resent whites. “The most offensive thing to me, fundamentally, is dividing kids by race,” Mr. Horne said. Mr. Horne, a Republican who is running for state attorney general, said he also objected to the textbook “Pedagogy of the Oppressed” by Paulo Freire. Paulo Freire? Textbook? I’d love to see Arizona’s schoolkids try their luck with Freire’s dense left-Hegelian classic, which, by the way, deals with an entirely different set of issues. The complete non sequitur of bringing up Freire, and the “textbook” nonsense, both suggest that Horne knows nothing at all about this topic. That in turn implies there may be a new intellectual conspiracy theory circulating among the far right. If so, get ready to hear that the triumph of secular humanism and collectivism in the indoctrination camps known as public schools all issue from this nefarious treatise by the former Brazilian theorist and activist. I’m waiting to hear what Glenn Beck has to say about the hidden threat of “dialog”. Casey Mulligan has gone overboard to Gilligan's Island in his latest fantasy about what happened in the housing market running up to 2006, "Was there a good reason for the housing boom?" http://caseymulligan.blogspot.com. While he admits that there might have been a little bit of a bubble, maybe, he is full of how it was mostly fundamentals. What were they? Well, the first one is that during 2002-06, people rather suddenly wanted lots more space in their housing because they were buying more stuff and wanted room to put it in. Funny about that, given how many people were buying more stuff by taking out home equity loans on the rising prices of their homes in order to buy a lot of that extra stuff. The other is something I have not previously heard a single person mention, although in this Chicago wonderland, people do not have to know what they need to know in order to know it. In this case, it is an expectation of lower housing costs in the future due to computerization and cyberization of the mortgage lending and completion process, obviously something of great importance to people not planning to sell a home soon or buying one in that period long before these wonderful improvements would arrive (which have not yet, by and large, but we cannot disprove that this expectation was operating to push up the fundamental, can we?). Regarding numbers, Mulligan is especially worked up about the Case and Shiller index for housing prices in major cities not having fallen all the way back to its low in 1997. It is at about 1.0 now, which it was in 1991 and 2000, with the low in 1997 around 0.8 and the high in 2006 at 1.4. If one looks at the price-to-rent ratios from around six months ago (latest I could find from Calculated Risk), http://www.calculatedriskblog.com/2009/11/house-prices-real-prices-price-to-rent.html, one finds that as of last November this index was at about 1.10, which was what it was in 2002, peaking at just under 1.35 in 2006, with it being 100 in 1990, and somewhat under that around 1997. Maybe there has been some upward movement of the fundamentals as measured by rents, but nowhere nearly enough to justify all the whooping that Mulligan carries on about in this piece. But what can one expect from a guy who blamed the rising unemployment as we went into the Great Recession on a sudden outbreak of laziness on the part of workers? President Obama proposes to increase tax rates on high-income households while making the existing tax rates permanent for taxpayers below the top tax brackets. While the increase would hit only a relatively small fraction of all households, that group represents a large share of total taxes and of private spending. Raising their tax rates would be a substantial blow to overall spending and therefore to GDP growth. While it is true that high-income households represent a large share of consumption, the issue is what is the marginal propensity to consume out of a change in disposable income created by a two-year increase in current tax obligations? For households who do not face borrower constraints and would therefore most likely behave in a fashion predicted by life cycle models of consumption, the impact on consumption demand would most likely be very modest at best. The Barro-Ricardian Equivalence proposition would go so far as to suggest that delaying a tax increase needed to restore long-run fiscal sustainability would have no effect on aggregate demand. If Luskin is Selling Stocks – Isn’t It Time to Buy? Wow! His record as a perfect contrary indicator remains untarnished! There were a lot of good reasons for stocks having risen as they did. First, we came from a terrible panic in March, 2009, when they were deeply oversold. Then as the rally progressed, it was fueled by a huge increase if corporate earnings, as the economy came out of deep recession. But all these things are cyclical. At the lows, earnings were depressed, and prices were depressed even more, so the price/earnings ratio for the S&P 500 was about 10. That's about as low as it gets. There have been times when it as lower, but that's about where it was at the worst in the Great Depression. At the highs in late April, the price/earnings ratio had risen to about 15. That's about as high as it gets. Sure, it got higher in the crazy years in the late 1990s. And there have been other exceptions. But that's about where it was at the highs in October 2007. So what we've seen was simply running from the low bound of the p/e ratio to the high bound; a classic cycle. Price to earnings ratios of 15 are not really that high if one expects earnings growth to continue. Our chart shows US corporate profits for each quarter from 2001 to 2009. Does Donald Luskin really think that corporate profits cannot continue to grow? Yep, there it is, the subheadline under "A new reality for the old world" for an upper left-hand corner, front page story by Howard Schneider on the front page of today's Washington Post. Wow. Except that this is one of the most distorted and off-the-wall headlines to appear in such a place in a long time, with the obvious agenda of wanting to say the same for the US (time for that deficit commission to cut social security anyone?). What is true is that for a country (e.g only Greece so far) to borrow from the newly established fund, put up by EU countries and the IMF and backed by the ECB, with a further backing by the US Fed, which has reopened its closed-down currency swap lines, it must engage in serious budget deficit reduction. Quite likely that will involve both spending cuts and tax increases, as have been voted for now by the Greek parliament, despite the riots in the streets by opponents of this. However, let us be clear. First of all, this is not at all a statement or policy about "Europe" as a whole at all, much less social contracts in general. As of 2006 Greece had a lower percentage of GDP going to social spending (24.2%) than the EU average (26.9%). Countries with the highest percentages include some that have much less severe budget deficit problems, e.g. Germany, Sweden, France, Austria, the Netherlands. This is a problem of tax collections and corruption and underground economies, not of an out-of-control "social contract." I am pleased to announce the publication of my book with David Colander and Richard Holt, European Economics at a Crossroads, being issued in both hardcover and paper back simultaneously from Edward Elgar. Several years in the producing, this book is the sequel to our 2004, The Changing Face of Economics: Conversations with Cutting Edge Economists, which created a bit of a stir by arguing for the possible existence of "non-orthodox mainstream" economists, with someone like George Akerlof being an example of this peculiar breed. We also argued strongly for viewing the economics profession and intellectual development as being a complex adaptive process. The new book continues this argument, but focuses on European economists and economics. The additional arguments involve the relationship between European economics and US economics. The former long protected many more heterodox intellectual traditions within national language traditions and publications and practices. However, this was also associated with hierarchical and stifling setups. The pressure to move to English and imitate US standards and practices, partly driven by Europeans attending US universities and returning to Europe, has both weakened these hierarchies and moved much of Europe to imitate US economics in many ways. We argue that while some of this is a good thing, there is a serious danger of imitating leftover third-rate orthodox US economics at its worst. Based on its past traditions, Europe has the opportunity to develop its own alternative and possibly superior approaches. Following two opening chapters laying out these arguments and their connection with our earlier complexity arguments, there are a set of interviews with Alan Kirman, Ernst Fehr, Cars Hommes, Mauro Gallegati and Laura Gardini, Tonu Puu, Soren Johansen and Katarina Juselius, Geoffrey Hodgson, Joan Martinez Alier, and Robert Boyer. These are followed by two reflective interviews discussing the others and broader issues with Janos Kornai and Reinhard Selten. Friday's WaPo reports that Virginia Attorney General Ken Cuccinelli, following up on his efforts to end efforts by state universities and colleges to avoid discriminating against GLBT folks, has decided to interfere directly in scientific research in a criminal way, http://www.washingtonpost.com/wp-dyn/content/article/2010/05/06/AR2010050605936.html. In particular, Cuccinelli is claiming that climate scientist, Michael Mann of hockey stick fame, engaged in billing fraud with the state while working on this subject while a professor of environmental sciences at the University of Virginia, where he has not been located for some years (now at Penn State). Cuccinelli is demanding all kinds of emails and other materials from the university, apparently attempting to imitate the climategate gang that did this over at East Anglia, only to end up with no fraud being discovered. I think that some of the critics of Mann's work were correct, but this is an outrage. There is no evidence at all of fraud (and those claiming the email in which he spoke of using a "trick" as evidence for this do not understand or are wilfully misrepresenting how this term is used in these situations) on his part, whatever errors he may have made in his study of the hockey stick (and it really does not matter exactly what the temperature was 1000 years ago; I have posted on this here previously). As it is, Cuccinelli is trying to justify his money and time wasting lawsuit against the federal government for trying to regulate carbon dioxide emissions. Maybe Cuccinelli is trying to replace Sarah Palin as the tea party's fave pol, now that she has annoyed some of them by endorsing Carly Fiorina for governor in California? We live in a violent society. When people become alienated they often do violent things. When the person is "one of our own," the violence is seen as a matter of individual responsibility. A man -- Joe Stack -- becomes troubled because the financial problems and flies an airplane into an Internal Revenue Service building. The response seems to be that he is mentally unbalanced or expressing justifiable indignation in an unacceptable way. A young Pakistani immigrant suffers financial and family problems, turns to religion, and tries to explode a car bomb in crowded Times Square. The response focuses on the religious angle because his religion is not the dominant one in the country. What if he had used a drone instead? Obviously, most of the victims have been innocent. Of course, we have no knowledge that our own drone attacks predominately kill "guilty parties"? And then again, if the drone attack had been successfully pointed at Wall Street, it would have undoubtedly kill people whose destructive activities have resulted in many destroyed lives. Would that be justified? Our own young people who operate the drones might be seen as some as heroes. The analogy of Wall Street and the military may be unduly provocative. And yet, the banks resemble a victorious government demanding reparations from a defeated enemy -- in this case, the losers of the class war. Why should ordinary people have to pay for the destructive behavior of the rich and powerful? I don't know if the people who recently burned the Greek bank were police provocateurs or militants angry with the government. In the former case, the objective was to harm the people who are presently being harmed by the financial crisis. In the latter case, they were behaving stupidly. The man who flew the plane into the IRS building was upset about how much he was paying to support the government. I suspect that he, or the people who expressed sympathy for his cause, are less concerned about military expenditures than the social programs, comparable to what the Greek government is forced to cut. Returning to the war theme, how much violence has been the product of people returning from the wars, serving the interests of Wall Street and the rest of big business. Timothy McVeigh was justifiably regarded as an outlier, but more common violence, such as individual homicides and suicides, seem to be far more common among people exposed to the violence of war. How much more guilty are the supposedly respectable people who promote our wars abroad than the disturbed young man who attempted to kill a couple hundred people at most? Instead, his incompetent attempt at violence will be used to justify far greater violence abroad. How can we put an end to such hypocrisy and the violence it entails? Finally, what about the everyday violence experienced by people denied the opportunity for a decent chance in life? What about inadequate healthcare or education? Isn't that a form of violence? If a capitalist society rewards some people with multibillion-dollar annual incomes of the official unemployment rate is near 10%, is it time to see that capitalism itself is a form of violence? Nonfarm payroll employment rose by 290,000 in April, the unemployment rate edged up to 9.9 percent, and the labor force increased sharply, the U.S. Bureau of Labor Statistics reported today. The household survey reports that employment increased by 550,000 in April, which increased the employment-population ratio from 58.6% to 58.8%. So why did the reported unemployment rate increase? The key here is this sharp increase in the labor force with the participation rate rising from 64.9% to 65.2%. Not bad for one month but a long, long way from full employment. White House officials stressed again Monday that BP would be held liable for the cost of the cleanup and economic compensation for losses on the Gulf Coast. But Democratic senators said the Oil Pollution Act of 1990, passed in the wake of the Exxon Valdez, caps economic damage liability at $75 million. Democratic Sens. Bill Nelson of Florida and Robert Menendez and Frank Lautenberg of New Jersey introduced legislation to raise that cap to $10 billion. Ball, Jeffrey, Stephen Power, and Russell Gold. 2010. "Oil Agency Draws Fire: Republican Seeks Scrutiny of Regulator; BP Tries Well Fix." Wall Street Journal (4 May): A 1. And how exactly does it generate the current account surplus? Why does the export of Chinese finance return in the form of net Chinese exports? Earlier in the article they denied that exchange rates have anything to do with it, so what other channel do they propose? This is based on a forthcoming article in the AER, which means that a few reviewers there must have been asleep at the wheel. Looks like an easy outlet to publish in; I should give it a try. Were Bubbles Or Fraud More Important In The Crisis? This was not explicity the issue at hand at the conference on Consumer Decisionmaking: Insights from Behavioral Economics I attended recently at the Dallas Fed (cosponsored with UT-Dallas), but it emerged as an issue in the final talk by Christopher Foote of the Boston Fed, who tilted to the bubbles side, drawing on the earlier keynote speech by George Akerlof, although George did not pose it this way. For Foote, even though fraud and corruption increased during the bubble (and Akerlof argued that they tend to generally in bubbles), it was the housing bubble that sent everything over the top to come crashing down so disastrously ultimately. Most of the other talks tended to focus either on misbehaviors by lenders and how to stop them (many participants among the 250 or so being people from many Feds or other govt agencies such as the FTC), or on the many psychological tendencies and limits that afflict consumers making them prey to such fraudulent and misleading activities. A good summary of these was given by the other keynote speaker, Sendhil Mullainathan. These include failures of perception, failures of analysis even when perception is accurate, and then failures to act even when both perceptions and analysis are accurate. I note a few other things reported including by Eckel and Croson of UTD that women, parents with children, and African Americans are too risk-averse for their own financial well-being, but from Jeff Carpenter of Middlebury, that risk preferences are not in general related to income or social class. Also unsurprisingly, people with low numerical ability tend to get into more trouble with their mortgage payments, all other factors held constant. I support all the moves to educate people better, to regulate the lenders more to be more transparent in their activities, and so on. But in the end I think I agree with Foote that it was the bubble and the psychological tendencies ("animal spirits") to such that led us into this most recent disaster, not the longrunning exploitation of innocent victims by fraudulent lenders that did so. The abuse of PowerPoint has been in the news recently, but it is never far from the thoughts (or deeds) of conference-weary academics like myself. We sit through, and often inflict on others, endless presentations, typically in the form of monotone recitations of vacuous generalizations, or worse, dense paragraphs, plastered on the screen in front of us as bullet points. We squint at giant tables with tiny numbers. Our minds reel as equations fly by. It is enough to make you want to cry out “Chicken, Chicken, Chicken”. Here is some simple advice I give my students, and try to follow myself, on the proper use of PowerPoint. Some of it was inspired by Edward Tufte, some is my own invention. 1. The center of attention for any speech should be the speaker. Speak in a way that connects to your audience. Make gestures and facial expressions. Look at them, not at a screen. A talk should be, above all, a form of human interaction. 2. If you have complex data, like large tables or long equations, put them in a paper handout, and distribute this to your audience. You can put much more on a page than on a computer screen, and your listeners will appreciate the opportunity to examine this information at their own pace. If I must display a table in Powerpoint, I try to have no more than eight cells, less if possible. This often requires ruthless paring and simplification. 3. The main purpose of PowerPoint should be to make the architecture of a talk more transparent to the listeners. The problem with oral communication is that, while it can be extremely engaging on a moment-to-moment basis, it is difficult to follow the structure of a long, complex argument. PowerPoint can help. Begin with a slide or two that presents the roadmap for the talk as a whole. Insert periodic slides that indicate where you are in this journey as you proceed. Most slides should serve to convey the structure of particular sub-points—mini-roadmaps, in a sense. 4. Slides should not be free-standing; they should not convey your argument apart from your verbal presentation. Bullet points, if you use them, should be compressed into as few words as possible, just enough to identify (but not explain) the ideas they refer to. (The bullet point for this recommendation could be “identification, not explanation”.) And never, never, never read the bullet points out loud to your audience. The center of attention should be on you, not the slides. 5. Think of each slide as a two-dimensional space, to be organized in a way that conveys the intellectual structure of your argument. In general, a list with equal indentation conveys logical parallelism. The vertical dimension of a list may convey sequence, but this usually needs to be indicated explicitly, for instance with arrows. A picture in the right column with several brief phrases in the left column says that these phrases pertain in a parallel or perhaps sequential way to the situation depicted in the picture. Indentation, on the other hand, implies either a subset/superset or supporting/supported relationship. When relationships between ideas are more complex than this, consider placing phrases in various locations on your slide, using boxes and arrows to make their interconnections clear. 6. Never, ever make a slide more complex than absolutely necessary. Abjure all of PowerPoint’s fancy bells and whistles. Keep fonts and color schemes as simple as possible. You want to your audience to glance at the slides periodically but pay attention primarily to you. 7. The reason so many PowerPoint presentations are dull is because a content-poor visual medium has become the center of attention. Reading an article or book is much more interesting, because articles and books typically have much more substance than PowerPoint slides. Listening to a lecture without PowerPoint is usually more interesting because of the human engagement audiences can have with a speaker who addresses them directly. So use PowerPoint sparingly: don’t try to replace the role of a written text, and don’t distract audiences from your communication with them. It should add a little clarity and a bit of variety to your talk, nothing more. Is Economic Theory Going Into Black Hole? Back from conference at Dallas Fed on "Consumer Decisionmaking: Perspectives of Behavioral Economics." Keynote speaker George Akerlof spoke on his recent book with Robert Shiller, _Animal Spirits_. However, beyond his speech he spoke more forcefully, declaring at one point, "economic theory is going into a black hole," both micro and macro.